Bulletproof foam? Not yet, but this is about as close as you will get. When Boost liquid fortifier is mixed with our Foam Coat it makes it incredibly strong and weatherproof, plus makes it stick to almost anything! 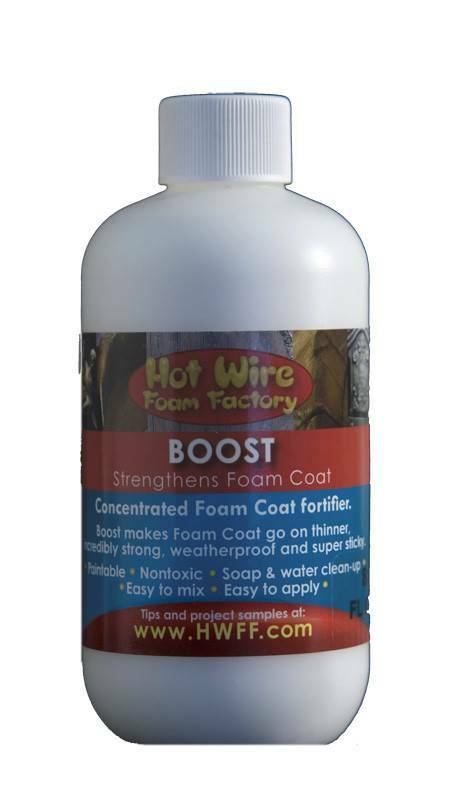 Use 8oz of Boost with 3-12 pounds of our dry Foam Coat. MIXING: Mix with 50% water for maximum strength. Thin more where less strength is needed. Always add the Foam Coat to the liquid. Start with 1 part liquid to 3 parts Foam Coat, and thin or thicken as desired. Thinning the Foam Coat with more Boost will not weaken it. APPLYING: Fill large cracks and holes with pasty mixture. To coat large areas, add more liquid until thin enough to apply with a paint brush. May be applied as thick as 3/8 inch, but multiple coats are stronger. Try texturing surface before coating sets. SET TIME: Use within 10 minutes. Sets hard in 30 minutes. Add acrylic paint to extend use time. Maximum bond and hardness in 24 hours. CLEAN-UP: Immediately clean tools and brushes with soapy water. Boost cannot be removed once dry. FINISHING: May be painted or stained.